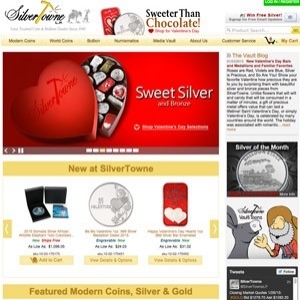 Silvertowne began as a small coin shop in 1949 to now a nationwide dealer and mint. It is considered to be one of the nation's most largest and respected dealers of rare coins, numismatics, and precious metals. They also have a retail showroom in historical Winchester, Indiana. Silvertowne has a serious business issue and the symptom of this problem is slow shipping. After doing business with other companies, specifically APMEX I am used to my gold being shipped the next day and received within 4 days of placing the order. Silvertowne has poor communication, rude customer service, and (just a guess here) they don't order the gold from their supplier until you place your order or the spread tilts in their favor. Silvertowne is aware of customers being unhappy with their shipping times and yet they do nothing to correct the issue. Just google silvertowne shipping and you will see this has been an ongoing issue with them. And if you look at their responses to the feedback from ebay, they are unrepentant. Something seriously wrong with this company. Going back to APMEX. Ordered some gold coins about 3 weeks ago. Since they had the best one price using credit. Their customer service is awful. Plus if you try to cancel they tell you there's a 20% fee. I'll be calling my bank for a chargeback. Since the payment posted on 2/21 & they still haven't shipped. I am a first time buyer with SilverTowne. I am normally a JM Bullion buyer. However JM Bullion does not engrave silver rounds. I placed an order for a 25th Anniversary Silver Round to be engraved on 2-5-17 (Sunday) in hopes to have it by 2-15-17. I called on 2-6-17 to inquire as to whether or not that would be sufficient time to have my order to me on time. The lady I spoke to on the phone said it should be sufficient time to have my order by 2-15-17. My order was shipped 3 days later. I was notified that I could follow the tracking info in a separate email. My package did indeed make it on time as promised. I was pleased with the service that SilverTowne provided. The only thing I didn't care for was the fact that I had to sign with UPS for a $104 order. I could see if I placed a very large order. I am glad I was here when UPS came by and that I didn't miss them. Overall, I am pleased with SilverTowne. They delivered on their word. I would probably use them again. Thank you SilverTowne. I have done business with Silvertowne for over 20 years. They have always been consistent, did what they said they would do with courtesy and respect. Hard to imagine someone doing a better job. The order number 439664 was ordered on 7/11/16. We received notification on 7/13/16 that the estimated delivery date was 7/16/16. As of today (7/19/16) UPS still has not forwarded the package to USPS for delivery. Silvertown contracts with these contractors. So whichever contractor dropped the ball. The liability falls from the top "Silver Town". Therefore we will not be doing business wth this irresponsible company. A responsible company would track the order out the door to delivery to the client. Silver Town has lost this client and the way we were treated, we won't be the last. For future clients. My we suggest to think twice before doing business with this company. There are several reputable companies in the market. Silvertowne is a Top Shelf dealer. I have bought from them many times over the years and have never had a problem. Highly recommended silver dealer. You will never have to worry about quality or quantity with Silvertowne !! Super Slow Shipping. Coins arrived slightly damaged. I placed an order for 5 statue of liberty head rounds and a Canadian maple leaf. A week went by and I had no order confirmation. I sent them an email and got a reply stating that they had gotten my order. I assume that after a week that my order would be on its way. I sent them an email asking for tracking info and was told that my order hadn't been shipped and that it took 8-10 days for them to ship. On the 10th day I sent them another email asking if it had been shipped. They replied that it was 8-10 business days before they shipped out and that they were waiting my Maple leaf to come in. I don't see why you would list something for sale that you don't have. I had placed and received two orders from other places while waiting for this one. I was starting to think I had been scammed when I finally got a shipping notification. The rounds took longer than the estimate stated. Three of the coins where damaged on arrival. I won't be ordering again there are better places to do business with. I have ordered from them several times in the past and have usually had a positive experience, however my most recent order will be my last. I have been charged for the dollars 1 month ago and still no shipment. ordered on Jan 21st and it's Feb 23rd and still no product! I'm told maybe by the end of the week! Which Week? I don't like being charged for something that they DON'T have in stock and can't give me a date when they will. That's IT! Will not purchase from Silvertowne again. Don't tell me shipping in 7-10 days and still don't have it over 30 days later. I've ordered silver bars a few times from Silvertowne. I've ordered rounds, 1oz., & up to 10oz. Also have a small amount of Gold. The biggest complaint I have is with their shipping. sivertowne ships out in a quick fashion, but it's how they have their carriers take it from there. It seems they start with UPS, then it's turned over to UPS Innovations. Then to the U.S.P.S. My suggestion is to either keep it with UPS or FedEx, or U.S.P.S. from Winchester to the destination. On one of my orders, it left central Indiana, went to Ohio, then to Kansas City, then to central Illinois, then finally to S.W. Indiana. It took 9 days, to go 216.2 miles. (Winchester, IN. to Petersburg, IN.) On my last order of a 10 oz. silver bar, I requested they send it by the U.S.P.S. It was there in 3 days. I figured it was going to be delivered by the mailman anyway, so why not ship it by the Postal Service to begin with? I have ordered from them several times in the past and have usually had a positive experience, however my most recent order will be my last. It took almost a month to ship an order of gold, and the only communication I received was the combination of phone calls and emails initiated by me. After weeks of delay I was finally told that the website didn't reflect real time inventory, and they had sold all of the gold bars I had ordered. I was told it would ship soon. At that point due to my ongoing frustration, I told them I simply wanted to cancel the order and receive a refund so I could order from a dealer who actually had the gold in stock. I was told I could cancel, but my order would be subject to a 20% restocking fee. I let them know this was ridiculous... I mean how can you possibly charge someone to restock inventory you don't even have?! That policy amounted to nothing more than a strong arm tactic to keep my payment while I was forced to wait on the shipment. Finally I just let it go and they eventually shipped my order. It was received and in fine condition but I'll never order from them again. That's poor customer service in my opinion, and the industry is too competitive for anyone to tolerate that. I have ordered silver from Silvertowne 9 times in the past 2 years. Every time the order was perfect & received in a timely manner. Most of the time what I ordered qualified for free shipping. I am completely satisfied with their pricing & their service. Thank you. Great company and buying experience with Silvertowne. Very pleasant talking with them on the phone and the silver I ordered came fast and quick! Just about 2-3 days for about 20 ounces of silver. They have a wide variety and selection of bullion. I ordered a single 1oz Silvertowne Stacker, just to test the waters of their shipping cross border to snowy Canada. Their confirmation emails were informative and when I contacted them directly regarding shipping method (I prefer USPS for cross border shipping to avoid brokerage fees) they were helpful and provided detailed tracking info for the USPS parcel. I got the parcel in under 5 days, which is what I expect for things coming from Canada. Quite quick for a cross border shipping. I had nothing bad to say about the experience. My only wish was that their premiums were just a little lower. A dollar less per stacker, and I'd have tubes of them by now. Silvertowne is one of the oldest minters and sellers around, and for good reason. Their prices usually include shipping, so it's a little higher. But if you buy in bulk, and after the fact it includes S&H and fees, the price is usually much better than most online vendors. Plus, you can find all sorts of cool one-of-a-kind silver pieces there. Shipping is fast; they process and ship in a few days, and you get the item in under a week or so. The website is fairly easy to use, I just wish they would have the same item give a discount for bulk purchase, instead of having to buy a 20pc item for cheaper instead of 20 of 1 pc item for more.